Moving work into the public cloud can be much like moving to a new datacentre, but organisations can often get caught out when trying to quickly adopt Microsoft Azure as their datacentre through a lack of familiarity with the differences. Why choose Trustmarque’s Microsoft Azure services? 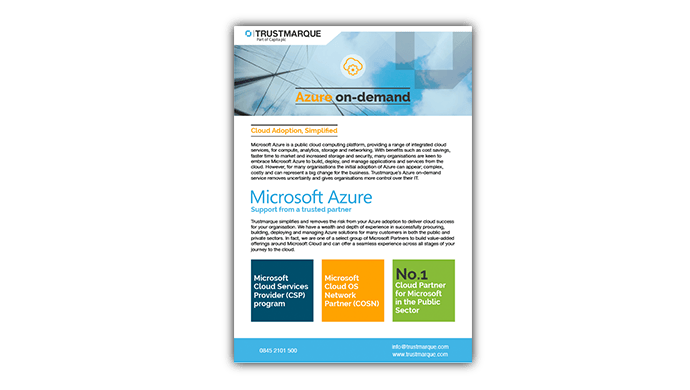 Trustmarque simplifies and removes the risk from your Microsoft Azure adoption to deliver cloud success for your organisation. We have a wealth and depth of experience in successfully procuring, building, deploying and managing Azure solutions for many customers in both the public and private sectors. Trustmarque has over 30 years experience working with Microsoft and are one of a select group of Microsoft Partners to build value-added offerings around Microsoft Cloud and can offer a seamless experience across all stages of your journey to the cloud. As an official member of the Microsoft Cloud Service Provider (CSP) programme and Microsoft Cloud OS Network Partner, (COSN) we are also number 1 Cloud partner for Microsoft in the public sector. Our dedicated Microsoft experts collaborate with organisations at every stage of the journey – advising, implementing and deploying innovative solutions to deliver successful outcomes. We help our customers with their cloud journey through the use of Microsoft Azure. Trustmarque will provide you with the consultancy you need to make sure that Azure is right for your business needs. Anytime, anywhere access – Azure runs on a worldwide network of Microsoft-managed datacentres across 22 regions so you can access applications no matter where you are. An adaptable platform – Our Microsoft Azure solutions support a wide selection of operating systems, programming languages, frameworks, tools, databases and devices making it easy to integrate into your organisation. Ease of integration – Azure can easily be integrated into your current IT environment through its network of secure private connections, hybrid database and storage solutions, along with its data residency and encryption features so your assets stay right where you need them. Security – an array of Microsoft defence systems to protect your data whilst in the Cloud. Flexibility – customise the cloud as needed. Scalability – Azure’s ‘Pay as you go’ services can quickly scale up or down to match demand, so you only pay for what you use. Less complexity and cost – Our Azure solutions allow you to run Azure in your own database with Azure Stack. From assessment and planning to execution and management, we’ll support you every step of the way to transform your platform. Our technology experts work with you, removing any complexity and uncertainty, so you can migrate swiftly to the Azure cloud, negating the need for in-house skills or resource. Moving work into the public cloud is similar to moving to a new data centre. The same core elements are needed, however with Microsoft Azure the names and properties are either slightly different or offer radical opportunities for change. Companies often get caught out by the unfamiliarity of a new data centre when trying to quickly adopt Microsoft. 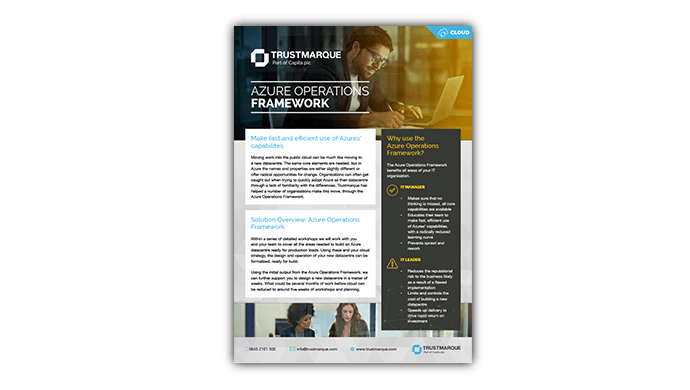 Trustmarque has helped many organisations to make this move successfully through our Microsoft Azure Operations Framework. We provide a series of detailed workshops to help you and your team cover all areas needed to build an Azure datacentre ready for production loads. Using these and your cloud strategy, we will be able to formalise the design and operation of your new datacentre, ready for build. We can also offer you further support in designing your new datacentre. This process can typically take several months of work, but by using the initial output from the Azure Operations Framework, we can reduce this to around five weeks of workshops and planning. Your Active Directory (AD) is critical to your organisation. Without one, your workforce will either have access to everything or to nothing at all. When Active Directory is running correctly, new starters can be added and leavers removed with ease. When it is not running correctly, delays can be caused and it can prevent people working efficiently. Moving Active Directory to the cloud allows your workforce access to cloud apps such as Office 365, and quickly scale your user base when required without needing to buy or install new infrastructure. Keeping your Active Directory on-premise, using a hybrid Active Directory solution, enables employees to access on-premise and cloud apps from any device anywhere while your IT department maintains full control over access and management of devices and apps. An Active Directory is an essential part of every organisation. An organisation that understands its Active Directory can easily accommodate both new starters, and employees that change positions within the company, by simply adding new users and adjusting access controls. What are the benefits of Microsoft Azure Active Directory? Many organisations are keen to embrace Microsoft Azure to build, deploy, and manage applications and services from the Cloud. However, the initial adoption of Azure can appear complex, costly, and can represent a big change for the business. 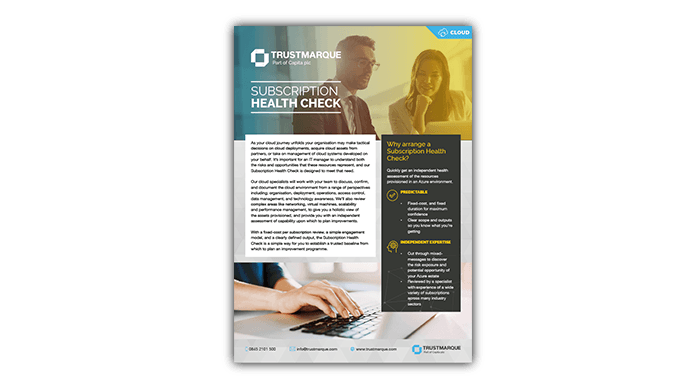 With Trustmarque’s Azure on-demand service, we remove this uncertainty and give your organisation more control over your IT. Trustmarque’s team of experienced Azure specialists provide support and services to simplify and accelerate your Azure purchase, adoption and usage so you get all the benefits of the Cloud with Microsoft Azure. Your cloud success is our top focus and our team will be there to support your Azure project delivery from start to finish. Microsoft Office 365 changes the way you access information and collaborate both inside and outside your organisation. Microsoft’s comprehensive Office 365 platform combines the familiar Office desktop suite with cloud-based versions of Microsoft’s next generation communication and collaboration services: Exchange Online, SharePoint and Skype for Business. 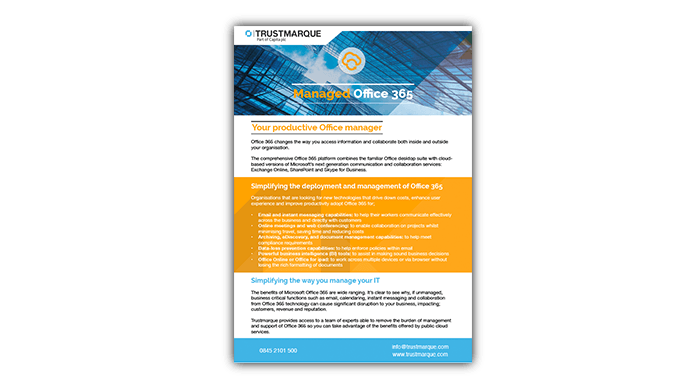 What is Trustmarque’s Managed Office 365 service? 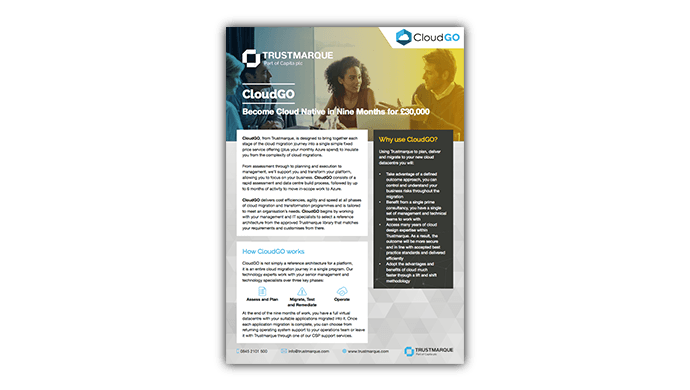 Whether you are looking to adopt Office 365 or to optimise your existing use throughout your organisation, Trustmarque managed service provides access to a team of experts able to remove the burden of management and support of Office 365 so you can take advantage of the benefits offered by public cloud services. As your cloud journey unfolds your organisation may make tactical decisions on cloud deployments, acquire cloud assets from partners, or take on management of cloud systems developed on your behalf. It’s important for IT to understand both the risks and opportunities that these resources represent. Our cloud specialists will work with your team to discuss, confirm and document your cloud subscription from a range of perspectives, including organisation, deployment, operations, access control, data management, and technology awareness. We’ll also review complex areas like networking, virtual machines, scalability and performance management. 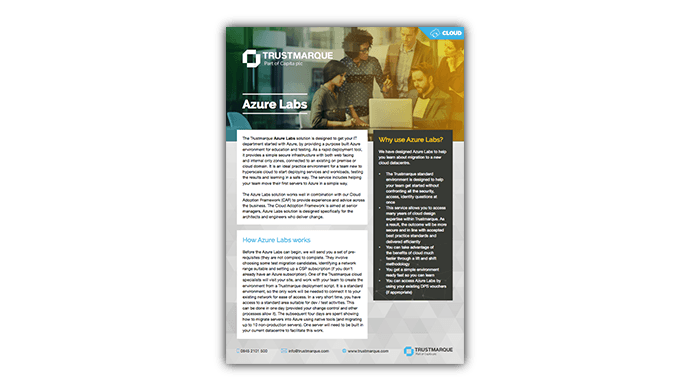 The Trustmarque Azure Labs solution is designed to get your IT department started with Azure, by providing a purpose built Azure environment for education and testing. As a rapid deployment tool, Trustmarque Azure Labs provides a simple secure infrastructure with both web facing and internal only zones, connected to an existing on premise or cloud domain. It is an ideal practice environment for a team new to hyperscale cloud to start deploying services and workloads, testing the results and learning in a safe way. Why use Trustmarque Azure Labs?